Jesus once told of a wealthy man who went on a long journey. Before the man left, he entrusted his wealth to three servants. To one he gave five units, to another just two units, and to the last he gave only one. Each received “according to his ability,” Jesus said. The servant with the five units invested them and made five more. The one entrusted with two units also traded with them, and made two more. The servant who had received only one unit dug a hole in the ground and hid it, keeping it safe, he thought. When the rich man returned, he demanded an accounting. The servant who had received five units but turned in ten was richly praised and rewarded. “Well done, good and faithful servant,” said the master. “You have been faithful over a little, I will set you over much.” The servant who had doubled two units to four received the same commendation. The last servant, who hid his master’s wealth in the ground, returned what he had been given; nothing lost, but nothing gained. The master rebuked him harshly, calling him wicked and taking his stewardship away. Then Jesus set down this principle: “For to everyone who has more will be given, and he will have an abundance. But from the one who has not, even what he has will be taken away” (Matthew 25:14-30). Stewards are entrusted with great responsibility. Those who lead are entrusted with a stewardship that comes ultimately from God and will be judged by him alone in the end. We are given a job to do and significant authority as a trust. We will shipwreck our leadership for certain if we do not remember that we are stewards, not lords, of all that we hold by trust. Convictional leaders are called to fulfill a stewardship of breathtaking proportions. The knowledge that our calling is stewardship is both liberating and limiting. We are liberated to lead, but we are limited in our reach. When you think about it, everything we do is bracketed between those two polarities, liberation and limitation. But, of what, precisely, are we stewards? In the first sense, we are assigned a stewardship defined by our calling and responsibility. We serve in defined roles and have job descriptions. At the very least, those realities help us to define our stewardship. Still, there are several aspects of leadership as stewardship that demand a closer look. The leader is almost always steward of more than any job description can cover. We are the stewards of human lives and their welfare. We have been assigned a task that will affect the lives of those we lead, and of untold numbers of others as well. Leaders are entrusted with those God made in his own image – fellow image bearers whose lives are precious to God and to those who love and depend on them. We are the stewards of time and opportunity. Few aspects of stewardship can compete with these. Leaders set the pace and determine which opportunities are taken and which are lost. Leaders have to be concerned not only with what their organization is doing, but what it ought to be doing. There are not many typewriter firms in business today. Missing an opportunity can spell disaster, and often does. We are the stewards of assets and resources. The financial health and wealth of your organization may not be the most important measurements of your leadership, but they are hardly irrelevant. The faithful leader knows that organizational assets are to be deployed in the service of the organization and its mission, and are to be invested and managed so that the wealth of the organization grows. This is not because we lead with the ultimate goal of financial growth, but because financial growth is needed if the organization is to fulfill its mission and extend its reach. We are the stewards of energy and attention. Leaders radiate energy and draw attention, or they cannot lead. Simultaneously, leaders bear the stewardship of energy, determining where and when the organization and its people should, and should not, invest energy. Attention is also a limited resource, as leaders learn fast and painfully. Effective leaders develop the stewardship of organizational attention and spend it wisely. We are the stewards of reputation and legacy. Just about everyone seems obsessed with branding these days, and brand consciousness is driven deeply into our entire culture. There is good reason for much of this obsession – we live and lead on the strength of our reputations. Organizations rise or fall on the strength of reputation. Leaders bear the stewardship of protecting and enhancing reputation and legacy, but those concerns loom far larger than mere branding. A product might be rebranded, but an injury to the reputation of a leader or an organization is rarely fixed by rebranding. Faithful leaders know that our legacy rides on our reputation and the reputation of those we lead. We are the stewards of truth and teaching. This is the essence of convictional leadership. Leaders are entrusted with truth, with deep beliefs and framing convictions. Those convictions must be taught and retaught, affirmed and reaffirmed, protected and cherished. Otherwise, everything we believe can be lost into confusion, corruption, and worse. As the stewards of truth and teaching, we hold a sacred accountability to perpetuate the very convictions that give life meaning, secure our hope, and summon us and those we lead to concerted action. Leadership is a trust, and we will answer to God for that trust. There will be many standards and structures of necessary accountability along the way, and leaders answer to an array of judges ranging from shareholders and stakeholders to the press and public opinion. In the end, all that really matters is the verdict we will receive from the one who invested us with this trust. The requirement of stewards is that they be found faithful. That’s why leadership is only for the brave. 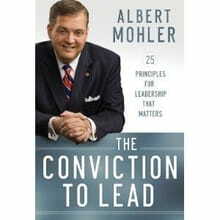 This essay is an excerpt from my recent book, The Conviction to Lead: 25 Principles for Leadership that Matters. It is available at Amazon.com,barnesandnoble.com, and your local bookseller. See also Leadership as Stewardship: Part One, published Monday, April 8, 2013.